Nong Shim Beef Noodle Soup is a 120 gram circular ramen with two packets - one with vegetable flakes and one with seasoning powder. Most of the 120 gram ramens that I have eaten have been incredibly spicy and flavorful. So, it was hard not to be a little disappointed by the relative blandness and gentle flavors of this non-spicy ramen. 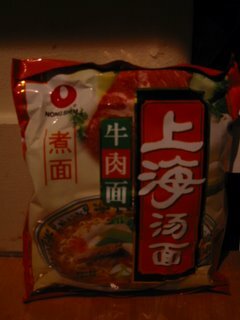 The seasoning powder smelled delicious as the noodles were cooking, but I found the broth to be only so-so and the noodles just standard. The vegetable flakes, while promising in their abundance, did not really rehydrate in the thin soup and did not have much flavor either. The "beef" taste was pretty much nonexistent. All in all, a completely average ramen. I'm sticking to hot and spicy in the future! A founding member of the Ramen Lover cult invited me to join after we had a ramen lunch in Cafe Mao on his recent visit to Dublin. This is my acceptance! Cafe Mao is at the heart of Dublin's newest and trendiest shopping district- Dundrum Town centre. Its chic decor and airy atmosphere were certainly welcoming for a ramen novice like myself. The menu was straightforward. It included a chilli scale, from 1-4, to illustrate the spiciness of each dish and also indicated which dishes had a low fat content. I ordered the Chilli Chicken Ramen which had 3chillies and was advertised as low fat. 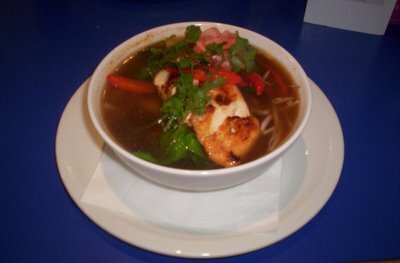 The description read "chilli marinated breast of chicken on egg noodles with pokchoy and chilli herb broth." We enjoyed some Mao home brewed bottled beers, whilst waiting on our food, which even had a picture of Mao on the front! I tasted the broth first and loved it instantly. It was hearty, tasting of the veggies, chicken and chillies. The vegetables included red onions, red peppers, sliced chillies, bean sprouts and pokchoy. The chicken was laid on top of the dish, which Alvin informed me is not traditional but rather for presentation purposes only. I encountered a minor problem with the chicken before I had to the chance to taste it. The entire fillet was sliced into only five pieces, which proved difficult to eat with chopsticks since each piece was easily three bites! When I finally managed to pick-up the first brick, it tasted great. It was juicy and moist on the inside and perfectly chilli sealed on the outside. On reaching the noodles we discovered that we had been deceived! I was not eating ramen noodles. After a consultative assessment with Alvin we concluded that there were in fact two types of noodles- Chow mein, disguising as ramen, on a bed of lo mein. In all honestly, had such an experienced Ramen Lover not been present, I never would have known! The noodles, despite their inaccuracy, were more than satisfying. In fact, Cafe Mao are free to fool me any time so long as it tastes this good! Nearing the end, the smack of the broth managed to get the better of me and I had to give up for fear of combustion. In all, a fine restaurant and a dish I would happily order a second time. As soon as I opened the flavoring packets, I knew that Mr. Kon was going to be a winner! My digital camera died, so no pictures, sorry. Mr. Kon is a 120 g ramen that comes with three packets - vegetable flakes, seasoning powder, and hot oil. The vegetable flakes are fairly low quality compared to other 120 g ramens of this type, but I was impressed by the flavorful aroma of the seasoning powder. 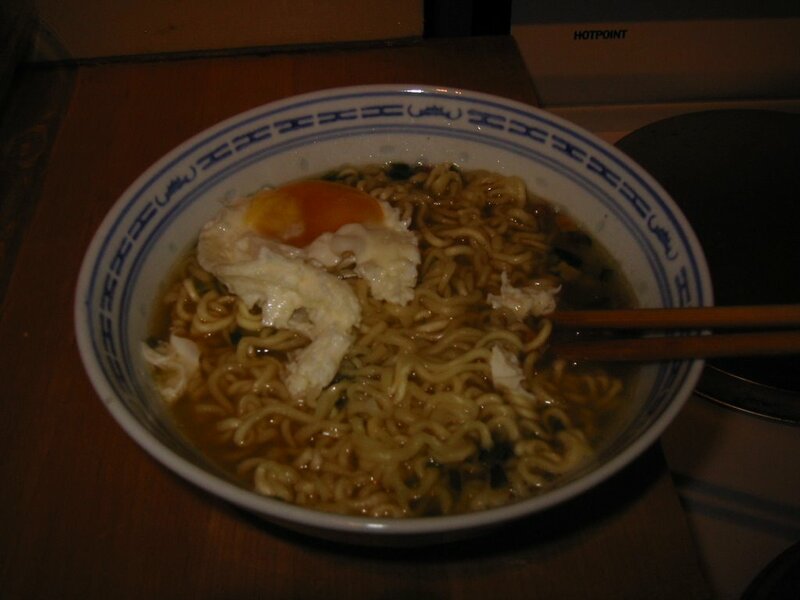 After cooking, I was pleased to find out that the ramen lived up to my high expectations. The noodles and broth were extremely flavorful and were actually both spicy and hot (as opposed to just hot). The spiciness reminded me mostly of peppercorns. And, there was actually a distinctive flavor separate from the spiciness and hotness that did taste similar to pork ribs! The noodles themselves were fairly good - not excessively chewy and they absorbed flavor well. All in all, a terrific ramen that I will certainly buy again. My only suggestion for improvement is to increase the quantity and quality of the vegetable flakes.